What started as a controlled burn near Barberville in northwest Volusia County went out of control this afternoon, growing first to 100 acres, then possibly doubling in size by 4:30 p.m., according to Flagler County Fire Chief Don Petito. The fire was sending smoke and the familiar, acrid smell of burning brush wafting over portions of Palm Coast and Bunnell, and glazing the sun in the characteristic orange hues of fire season. The fire by then had jumped State Road 40, closing 40 between County Road 3 and the St. Johns River, and was moving north and “spreading east and west,” Petito said, as it approached the Flagler-Volusia line. The News-Journal was reporting in mid-afternoon that four houses had so far been evacuated in the vicinity of the fire, on Byrd Road and Jerico Road. Volusia requested help. 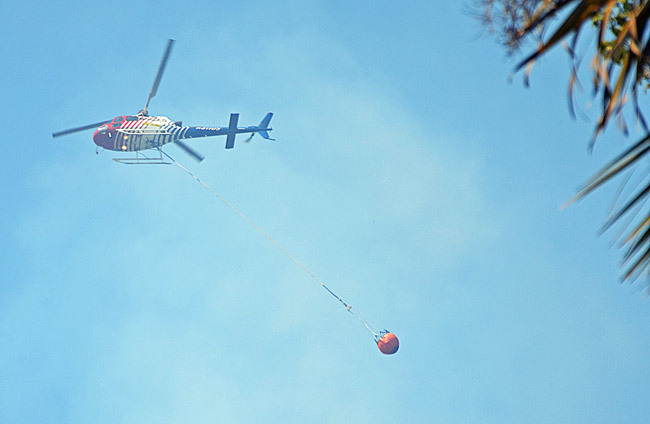 Flagler County sent its Fire Flight helicopter, which joined two other helicopters from the state Division of Forestry as the trio has been dumping water on the fire. The fire started as a controlled burn by the state Forest Service in Lake George Forest in the 14,000-acre Dexter Mary Farms Wildlife Management Area. At 5:25 p.m., Fire Flight was on its way back to Flagler County because of a mechanical issue. But by then fire officials in Volusia appeared to be heading toward mop-up mode in some areas, suggesting the fire was being brought under control. Why do they allow “controlled burns”? I have been here for 5 years… and in that time, I have read about more than one incident of “controlled burns” going awry. Don’t people ever learn…. especially during a time when we have had so very little rain… and fire hazards are high? It just makes no sense to me…. and the public has to suffer from such stupid actions. Sad times, indeed…. when common sense seems to have gone away. Sad Times, if we did not do control burning, the wildfires would be worse. Yes, there is control burns that get out of control, but it’s a lot safer to control the under brush, which is fuel for a wildfire. I have been here all my life, and we have always control burned every three years on our property, which is over 200 acres, and when wildfires have broke out, we have never had a problem on our property, because we have kept the under brush at a minimum. I can’t thank the firefighters and fireflight enough as should everyone else. They are the best. Thank you Palm Coast fire rescue, Flagler Beach Fire rescue and all that help keep us safe.